Wednesday was a long day, so wore this dress again to be comfortable. After work, DH and I had our first antenatal class at the hospital. It was really good, answered a lot of questions for us and we got a bit of a tour. So exciting how close we are getting to baby's arrival! I thought about getting changed for the class, but figured the dress would be fine. There were a few people who had come directly from work like ourselves too. I've never been around so many pregnant ladies in one place before, was interesting seeing how everyone dressed for their bumps. Last worn: Soon Maternity wrap dress, cap toe flats, Balenciaga sorbet city. Pink Balenciaga city bag again today! 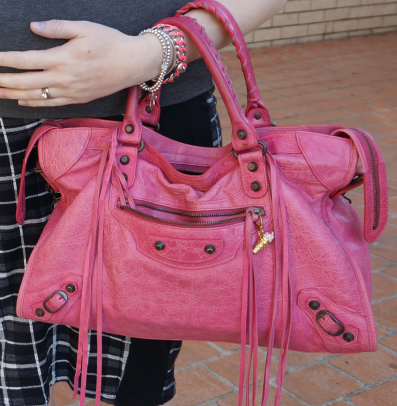 Although it's not Friday, this post will be live on my blog on Friday, so had to have a little bit of pink in support of Renae :) Pink accessories seemed like a good choice, and it means I didn't have to change my bag. Just a simple pencil skirt and tee outfit again. I really wish I'd bought more colours or even a backup of this tee when it was still made - it really is the perfect tee! 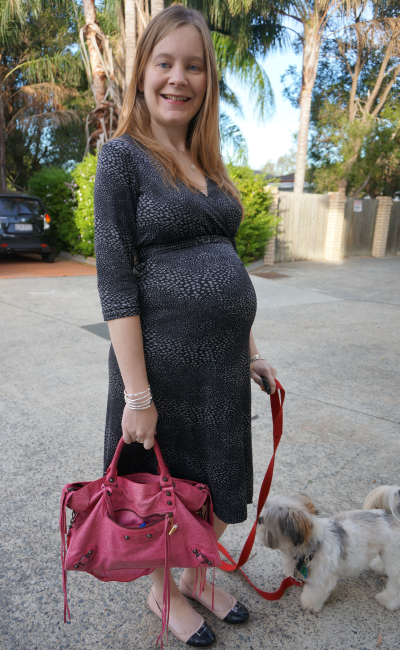 It's even able to handle the second trimester and third trimester baby bumps and still look good! Last worn: Atmos&Here grey tee, Asos tartan pencil skirt, studded mouse flats, Balenciaga sorbet city (see above). Linking up with Three-Fer Thursday, What I Wore to Work, Fashion Item Friday, Friday's Fab Favourites, Fashion Informant today. You look beautiful, Mica! You're just glowing! The ice cream cone JC charm is really cute! It really goes well with this particular colour of the Balenciaga! The balenciage city bag is always a good choice! The second look is so great! You are looking beautiful!! I love your first outfit a lot!! Loving the tartan skirt on you Mica!! And really, that charm? Absolutely adorable!! you look gorgeous! love the outfit as always! The wrap dress is beautiful on you! Love how you style your bump! Aha, yeah I bet that was interesting to see how everyone dresses for their bump. I bet you're the classiest dresser though ;) Haha always wearing the pretty dresses and skirts! hehe oh no there were some really stylish ladies there! I was so jealous of some of their wardrobes! I love that great wrap dress on you! The color of your purse is so pretty - perfect shade of pink. Hahah, "it was interesting to see how everyone dressed their bumps", that made me laugh. I'm just picturing a 7-year-old child in there; how much chaos would there be, a poor head bumping into all your babies. Hahaha. I have strange thinking, I realise. I'm not a big fan of soaps - don't watch them very often! Love that dress! It looks too cute on your belly! :) no surprise, another amazing bag!! Wow - what an amazing bag - the colour is gorgeous! Your maternity style is awe-inspiring. You look fab! that pink balenciaga looks great with BOTH outfits! I bet it was exciting see the other women about to have babies. So sweet. First antenatal class! How exciting. It is! Can't believe how close baby's arrival is now! That is a great tee...and it's often so hard to find one you love. You look great...pregnancy suits you.